Increased speeds otherwise apart from burgundy body casing similar to the AGC single and two speeds. Basically identical to the Andis AGC single and two speed machines but with higher cutting strokes per minute in both speed levels, and the burgundy body colour. 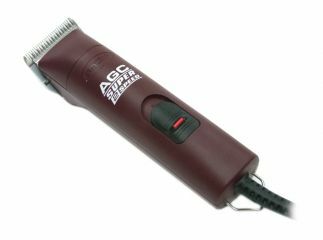 Made in the USA – an impressive looking professional dog groomer’s clipper at an economy price compared to many others. Unfortunately rather to many feedback comments over the years from proffessional groomers suggest there may be overheating problems, and for this reason we have downdraded the clipper ratings. Good design features incorporating an attractive slim shaped and compact handpiece gives a combination of balance and lightness, to ensure the operator a comfortable clipping operation. Blade attachment is easy to operate, smooth and crisp. 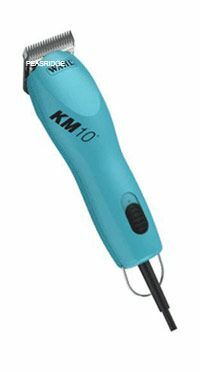 Under prolonged use the motor remains cool running, with an acceptable noise level (2) and little blade vibration at either speed levels, this clipper is a good choice for any busy dog-grooming parlour. Cleaning and servicing the head has been made easy by good and thoughtful design. Low maintenance is a feature of this machine. The Andis detachable A5 type blade range has been built in to one that is today unequalled by other blade manufacturers and certainly one of the most comprehensive blade ranges for most grooming situations. Those persons who already have detachable A5 type blades will find they can use them on the Andis AGC 2 speed (indeed most Andis clippers unless stated otherwise) The range of Andis wide detachable blade have been added to with several well suited to being used on livestock breeds.